Hotel Santo Stefano, 2 stars of Igea Marina, boasts comfortable and family rooms and has a open-air porch, free parking, free WI-FI connection throughout the entire hotel, air-conditioned rooms, entertainment and services for children, free bicycles . Admits small pets. The hotel is located in Igea Marina not far from the beach, in the pedestrian area around Viale Tibullo, with all kinds of shops, clubs, games and attractions for everyone. The structure is surrounded by green areas (such as Parco del Gelso) in a quiet area. The rooms have balconies, air conditioning on request, digital terrestrial TV, WI-FI connection and private bathroom with shower or curtain, hairdryer and complimentary toiletries. 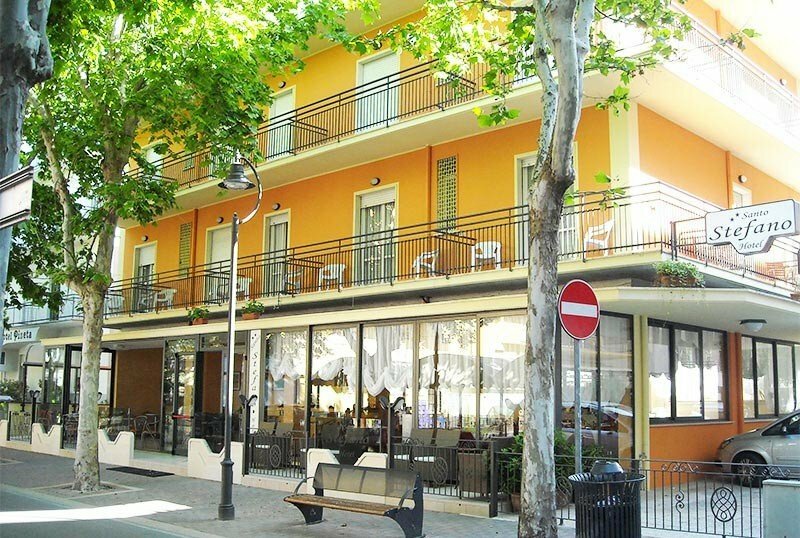 Hotel Santo Stefano has a furnished open-air porch, terrace and free bicycles. Theme nights are organized. PARKING: covered (13 seats) and uncovered available for everyone. CONVENTIONS: beach, amusement parks, discos, gym, swimming pool, waterslide. BREAKFAST: dessert with jams, chocolate, butter, cereals, yogurt, ring-shaped cake and homemade pies. LUNCH AND DINNER: two-choice menu, vegetable buffet, water available, pasta and desserts are homemade. Dinner is served buffet style. In hotel: outdoor playground area, entertainment, strollers, pediatrician on request. At meals: baby menu, baby food, bottle warmer, seats at the table, refrigerator for meals. Hotel Santo Stefano has an agreement with the Bagno Solaria bathing establishment with playground area, entertainment for children, bocce courts, beach tennis court, table tennis, table football, books, magazines and newspapers available, fitness area, relaxation area and WI-FI area. The prices of the price list are per person per day in person complete for a min. 3 days. Hotel Santo Stefano is located just 30 meters from the sea in the central area of Igea Marina, on Via Tibullo with an evening pedestrian area and shops for your walks. The family management and the welcoming climate are the peculiar characteristics of our Hotel without forgetting the home cooking called Romagnola tradition. Offer at the end of May-June, minimum stay of 3 days in Full Board with water at meals, starting from € 38.50 per person per day. up to 6 years FREE and the others discounted.